I made this card for one of the loveliest people you’ll ever meet and today is her 40th birthday. I used a mix of patterned papers and Cricut cartridges to make this card. The little squirrel, cut at 1″ tall, is from Noah’s ABC’s. If you don’t have this cartridge, you should buy it for the truly beautifully styled animals. The chicken, squirrel, and cow are wonderful. The wheelbarrow is from Walk in My Garden (1.5″ tall). The rolled flowers are from Artiste (2.25″ tall and 1.5″ tall). The 40th birthday candle is from Something to Celebrate (1.5″ tall). The circle cuts, scalloped circle, and pumpkins are from Cricut Essentials. I cut several layers and adhered them together to add dimension and strength. The wheelbarrow was cut twice in the woodgrain paper and once in solid gray. I trimmed the wheel from the solid gray cut and adhered it on top of the layered wheelbarrows. I used my Copic E59 walnut to add a “stem” to the pumpkins. The patterned paper circle is adhered to the Bazzill layer with foam tape. The ribbon is from Paper Trey Ink in Smokey Shadow and the sentiment is stamped in the same color. The papers are from Basic Grey, My Mind’s Eye, Kaisercraft, and Bazzill. 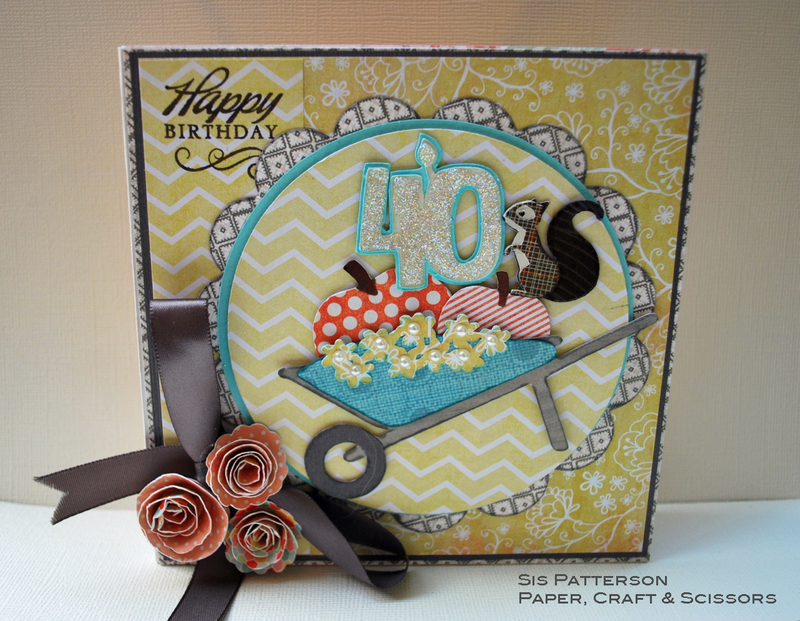 I used Paper Trey Ink as the base for this card and applied the patterned papers on the front, back, and inside of the card base. Before adhering the patterned paper, I scored the Paper Trey Ink cardstock with a quarter inch wide center fold to allow for some inner depth. I used Sparkle and Sprinkle glitter in Snow Angel for the candle. The completed card measures 5.25″ square. 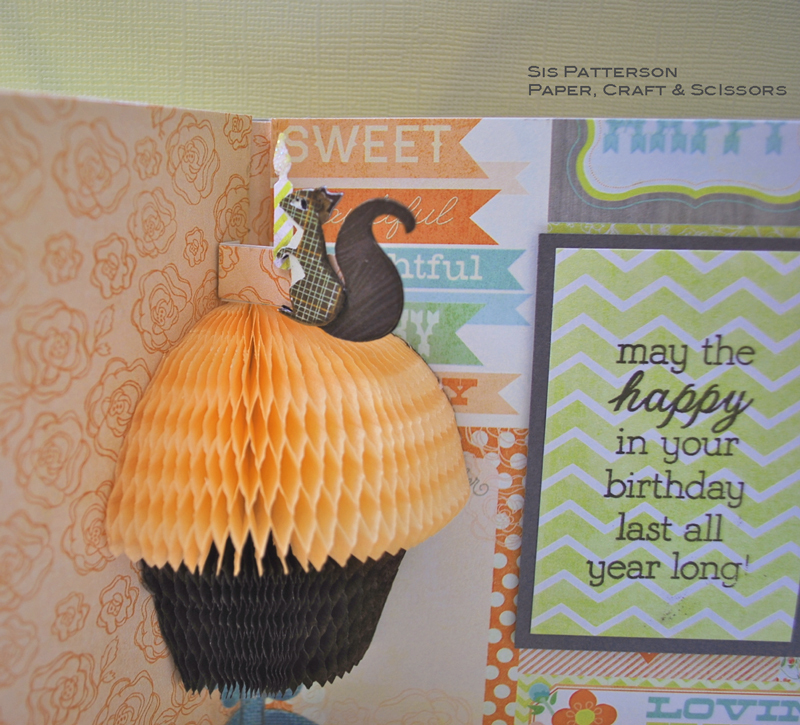 The cupcake is from Inky Antics and uses brown and apricot honeycomb paper. I made a cupcake stand with a circle punch. There is an identical squirrel to the one on the front perched on top of the cupcake holding a little birthday candle from a Martha Stewart punch. The inner sentiment area measures 2″ by 3.25″. I framed it in the Bazzill card stock and attached it with foam tape. The sentiment is from Hero Arts. A 5.25 inch square card has become one of my favorite chunky card sizes due to Lori Whitlock’s fabulous 5.5 inch mailer available for purchase at the Silhouette store and in her on-line store. 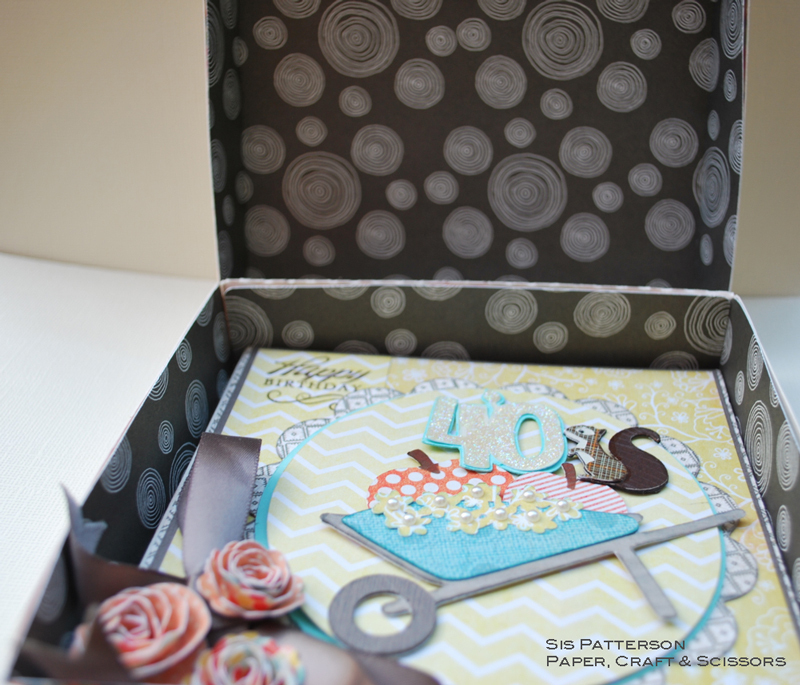 I used Paper Trey Ink for the outer box and patterned paper for the interior. What a great way to package and personalize your mailer for your cards. Check your mailbox today for delivery and Happy Birthday, Sherry! Your card is magical! I love that little squirrel who travels inside the card for another surprise! Lovely imagery, pattern, and dimension! Love that little mailer too– brilliant! I finally got to see your face in the mania pix. I was scouring posts for that famous Sis O’Snap name. I had a “so that is what she looks like” moment. Great fun. Your card is, of course, fabulous. I love your tiny squirrel and that honeycomb pop out. And your box is the perfect finishing touch. Glad to see you have recovered enough to craft again. Hope you had an amazing trip. Hugs. Awesome card & packaging! I saw it this morning on the Cricut FANatics blog (& left you some love there too). It’s so fun to take in all the details on your projects…thanks for sharing some inspiration with us! I love, love, love this card!! And even more so that you’ve shown us a NEW way to mail them!!! I am embarassed to say that my card left in a yellow work envelope. But, you can bet I am off and headed to buy Lori’s mailing box right NOW!! That is terrific. You are so talented! I just love it. Another beautiful card Sis! I am always amazed at the pattern papers that you choose. I just love everything about this card, especially the little squirrel. The mailer is a pretty awesome idea for a dimensional card as well! Hi Sis! You won the Halloween Blog Hop prize on my blog. I’ve submitted my e-mail via this comment – please let me know what your e-mail is so that I can send it to you. Oh, my — this is such a wonderful card — you are so talented!! Love the squirrel and that fun cupcake! !